In the United States, the Spanish language is often used as an identifying marker for U.S.-born Latinos and Latin American newcomers, whether they speak it or not — because not all Latinos speak Spanish, and I am not just referring to later-generation descendants of Spanish-speaking people. There are 45 million indigenous people in Latin America, and many more from the 826 distinct indigenous communities have come to the United States after being displaced by violence or environmental degradation and/or seeking the same sort of alternatives and opportunities that many other immigrants do. Although about 60% of indigenous people in Latin America are bilingual (meaning they speak both the dominant language in their country, which is Spanish for the majority of the continent, as well as one or more indigenous languages), 20% speak only the dominant language, and the other 20% speak only indigenous languages (according to recent studies by ECLAC). Receiving communities across the U.S., including West Michigan, are learning that they can’t assume that all people from Spanish-speaking countries indeed speak Spanish, which challenges the bilingual (English and Spanish only) support structures that are set up to accommodate Latinos with limited English proficiency. Voices of NY reported earlier this year on the case of a Guatemalan man who went missing in Brooklyn and it took his family 8 months to find him because court records had the wrong spelling of his name; the Spanish spoken by the court interpreters offered as little to him in the way of understanding as the English spoken by the court officers. 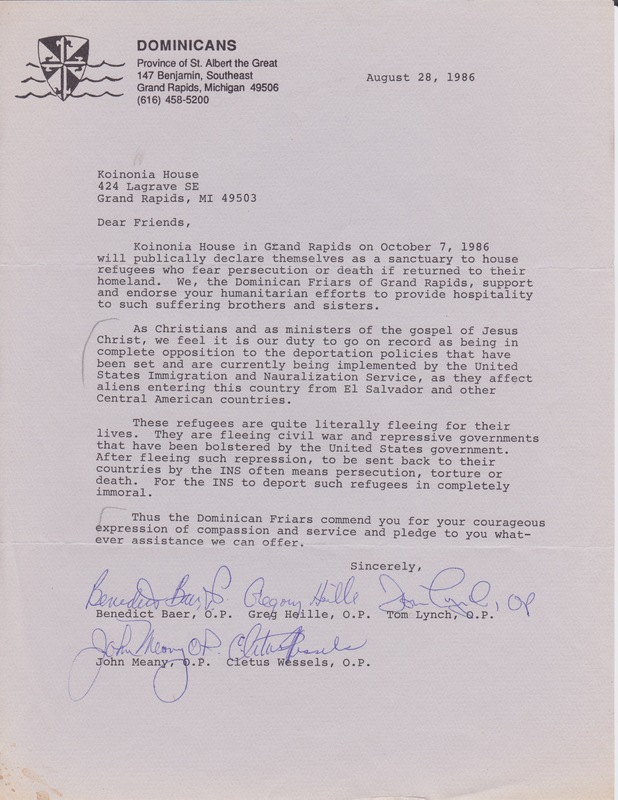 Letter from the Dominican Friars of Grand Rapids declaring the Koinania House as a sanctuary for Central Americans. From the Grand Rapids People’s History Project. Grand Rapids is home to indigenous Guatemalans as well. In 2014 the Grand Rapids People’s History Project published an online series about how faith-based groups in the area created a sanctuary for Central Americans fleeing violence in the 1980s. The first people to arrive in Grand Rapids under the Central American Sanctuary movement were two indigenous families from Guatemala in 1987. The history of this community does not seem to be well documented, from what I can find, but it makes sense that other indigenous people followed their relatives and neighbors to Michigan. In fact, approximately 6,000 people or over one-third of the residents of Cajolá, a Mam Mayan town in Guatemala, have come to the United States — and 1,000 of them have settled in Grand Rapids (according to NACLA). Indigenous Latin Americans, especially those who don’t speak Spanish, are stigmatized and marginalized by the majority culture in their own countries. When they come here as immigrants, they are frequently invisible as part of the larger Latino community. When I searched several different combinations of the words indigenous, Mam, Guatemalan, Grand Rapids, and West Michigan, I found very little information online. Colleagues who work with Latino organizations in the area are aware, at least anecdotally, of the Mam-speaking community here, and it appears that there are Mam interpreters working in the healthcare and legal settings. It’s important for those of us who advocate for bilingualism to acknowledge and to continue to expand the space for indigenous Latinos to have their own voice, even if it is not one that speaks Spanish. The word for “literacy” in Spanish is an example of linguistic ingenuity: alfabetización. An invented English translation would be “alphabetization,” or acquisition of the alphabet, the set of building blocks for written communication. An image of a classic silabario, or a phonetics book that uses basic syllables to teach Spanish literacy. This silabario is designed for children, but I have seen it used to teach literacy to Spanish-speaking adults in the U.S., which demonstrates the need for pedagogically appropriate curricula for this population. Over the last 10 years I have developed a strong curiosity and academic interest in adult literacy. For children with access to education, learning to read and write is an age-appropriate activity that is nurtured and celebrated. But children without access to education, or who have access but experience barriers to developing literacy, become adults who often hide their inability to read and write and have to come up with survival strategies for living in a world of assumed literacy. The latest figures from the National Assessment of Adult Literacy showed that 14% of adults in the U.S. lack basic literacy skills in English. Within that group of the population, 39% identified as Hispanic. Those who identify as Hispanic may not necessarily speak Spanish, and they may not necessarily be first-generation immigrants, but the term “Hispanic” is used to group people from different ethnic and racial backgrounds who all share some relationship to the Spanish language. One source estimates that it would take 500-1000 hours of instruction for an adult who is literate in his or her native language to acquire basic literacy skills in English. The key phrase in that sentence is “literate in his or her native language.” If such an adult received instruction for 3 hours each week, 52 weeks a year with no vacations, it would take him or her over 3 years to accumulate 500 hours of instruction. How much longer would it take an adult who is not literate in his or her native language? Let’s go back to those children who don’t have access to education or who face barriers to developing literacy. Then imagine those children growing up to become adults who leave their countries of origin and arrive in the U.S. where they have to learn to communicate in a new language, English. There are ESL programs available to them through schools, churches, and community organizations, but when they walk in to the first session, the instructor starts writing on the board and handing out texts or workbooks. As someone who has never experienced anything like this, I assume it would be a little bit like arriving in a remote part of Japan, where I not only do not understand the language being spoken, I also can’t decipher any of the written characters on signs or printed materials to attempt to associate the sounds I hear with what I see. As I mentioned before, I have collected anecdotal evidence that nearly every Latino community in the U.S. probably has a small group of first generation Spanish-speaking adult immigrants who are not literate in Spanish. Those communities with large populations of immigrants from countries with lower literacy rates, such as Guatemala or Bolivia, may have greater numbers of Spanish speakers who cannot read or write in their native language. Furthermore, Latin Americans from indigenous backgrounds may speak Spanish as a second or third language, which could represent even greater barriers to Spanish literacy. I am currently doing research to find Spanish literacy curricula developed specifically for non-literate Latino immigrants, who were not only marginalized in their countries of origin, but are also living on the fringes of a marginalized group in the U.S. The Centro Latino for Literacy in Los Angeles has developed one such curriculum, called Leamos. You can view a video about their initiative here that includes a testimonial from a woman named Mercedes. I will post more updates as I dig deeper into this important issue. Be grateful for your literacy skills today!